Ever had a rock hard, too dry pork chop? I must admit, when I was a new teen mom, that was what I served my little family. YIKES! I honestly thought that’s how pork chops come out when cooked on the stove. Needless to say, I barely cooked pork chops. That’s until I tried my cousin Lucy’s oven baked pork chops. My relationship with pork chop took a turn. I called family members to ask their secrets. Now, I love pork chops. 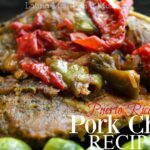 These moist Puerto Rican pork chops are my go to when I am in a time crunch and want a meal with tons of flavor. 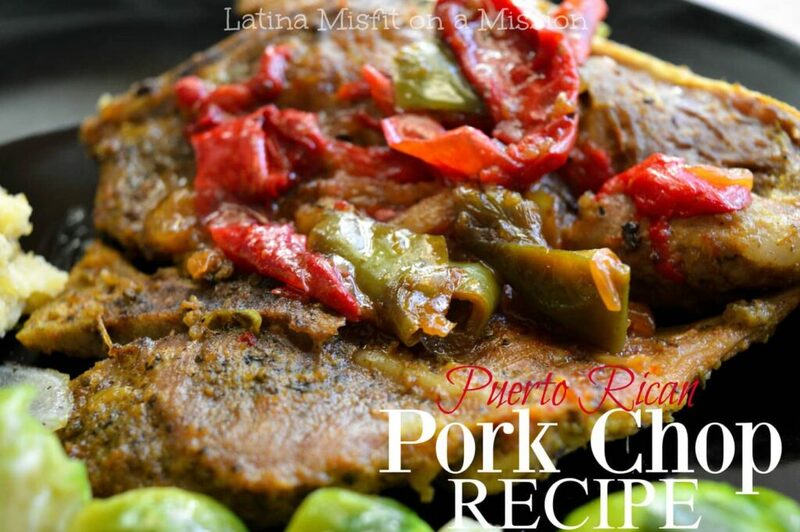 What’s the secret to making juicy Puerto Rican pork chops? Do not overcook your pork chops. I’m serious, pork chops take about as long as boneless chicken do to cook, depending on thickness. If you want to get technical, the temperature should range between 145-160 degrees Fahrenheit. Also, steer clear of high temperatures. High does not always equal fast. 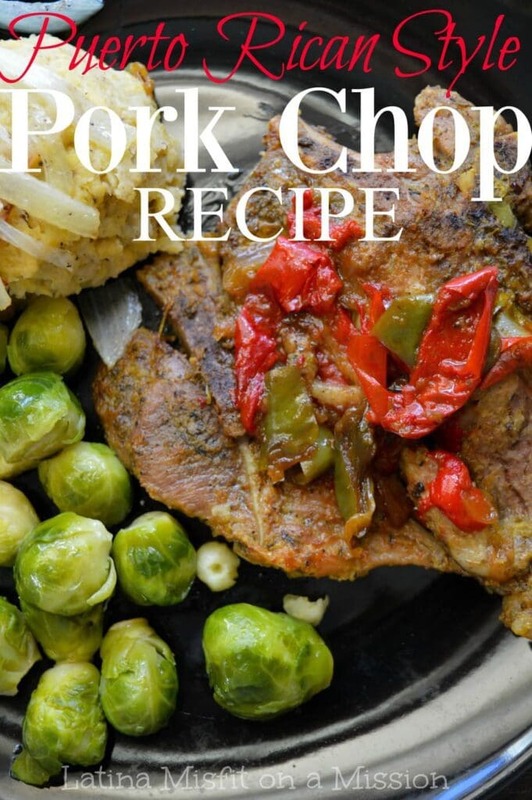 Go check out this article by Bon Appetit for more neat tips for cooking your typical pork chop. The beauty of pork chops is the versatility. But, always choose bone in, unless you’re making a pork chop spaghetti recipe (coming soon). Honestly, chicken needs to watch out, pork chops are taking over! What I especially love about Puerto Rican pork chops is the bold flavor. The secret to perfecting the moist pork chop is making sure you cover your pork chop while it cooks. Pork chops generally cook in a matter of minutes, that’s why I brown my pork chops first, remove them from the heat and soften any veggies. Then I throw those bad boys back in. I mean, I gave them a well-needed rest period right at the peak of their cooking, sorry pork chops for the tease! But I found this technique to work amazing with this recipe. As mentioned above, after browning the pork chops, softening some veggies (onions and peppers used here), and throwing back in the pork chops (whew) I like to add some liquid. I add a little bit of tomato sauce, sofrito, and a teensy bit of vegetable stock. Give that a good stir, add in additional seasoning if necessary, quick stir and then cover that pot and let it do it’s magic on low for a few minutes. The point of the added liquid is the make the pork chop juicy and to have just enough to add juice to whatever is going on the side, but this particular recipe is not a guisado (stew). The sauce is more of a gravy, a very tasty gravy. This particular Puerto Rican pork chop recipe is great accompanied by white or yellow rice, or some tasty Dominican inspired Mangu. I hope you enjoy this, let us know in the comments if you have ever made this or what you’d like to see made next. As always, buen provecho! This juicy pork chop recipe holds true to the flavors of Puerto Rice all while being time friendly and ready in less than 30 minutes. In a large pan, heat oil over medium high. When oil is hot, add in sugar and gently stir for a few seconds, add in pork chops and brown on both sides. Remove pork chops and lower heat to medium. Add in onion, peppers, sofrito and tomato sauce. Sautee for a few minutes until softened. Return pork chops and any juice on plate to the pan and remaining ingredients. Cover and cook for 15-20 minutes, lowering heat if necessary. The flavors are awesome! I only had boneless chops on hand so they weren’t as tender as bone in would be, but still so wonderful. Thanks for another great recipe! your recipe is incomplete in the instructions, it doesn’t say where to put the seasonings like the adobo, garlic powder, oregano,and tumeric. It only states to salt and pepper the pork chops. 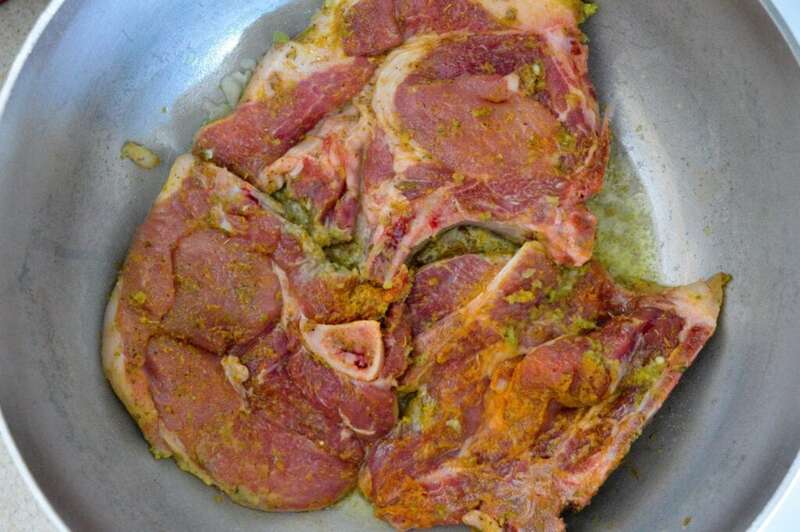 The pictures show the pork chops what looks like sofrito. Absolutely delicious. Thanks for sharing! Can I use my Ipot ? It’s like a Pressure cooker. 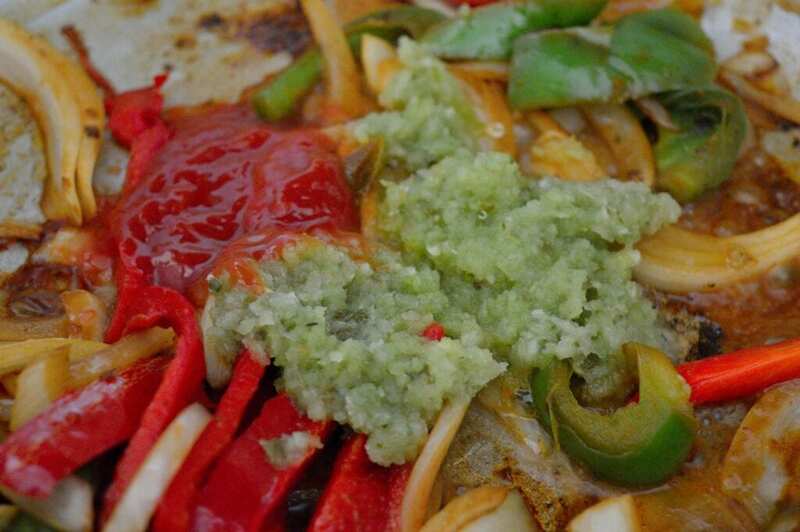 Thank You For Sharing This AMAZING RECIPE ! I Cooked It For My Family 2-12-19 And They LOVEEED Them !